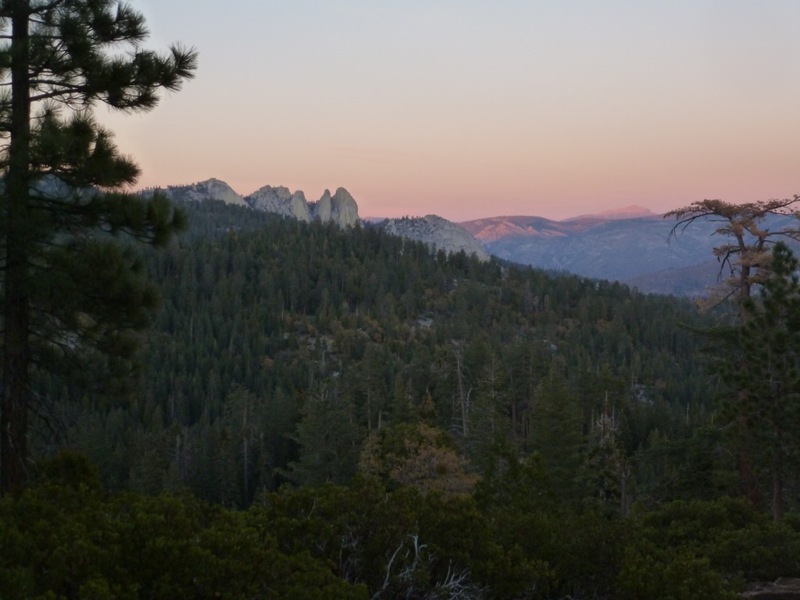 The Needles are an impressive line of domes/spires along the Kern River at the southern end of the Sierra. The Needles themselves offer multi-pitch trad routes with about an hour-long approach from above (high clearance required) or below (high gnat tolerance required). 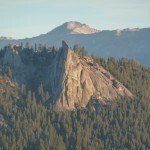 Nearby Dome Rock has numerous 1-2 pitch trad routes and some hard sport face routes accessed by a road leading right to the top (it was previously used as a heli-pad), as well as a few excellent primitive campsites. Both are a reasonable drive from LA, and the weather, while currently too cold up north and too hot down south, is near-perfect there. Jen and I drove up late Thursday night and, after deciding not to try the Needles Lookout Road in a passenger car, crashed at a lousy ad-hoc campsite. We then enjoyed 3 days of near-perfect weather and interesting climbing. 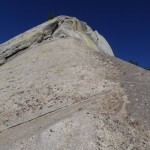 Both the Needles and Dome Rock are well worth visiting, and White Punks on Dope (Voodoo Dome) and the Tree Route (Dome Rock) are not to be missed. 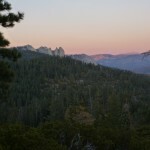 Rather than hiking the rest of the Needles lookout road, we decided to take an easier day at nearby Dome Rock. First up was the easy but highly-rated Tree Route (5.6), which follows amazing hand- and finger-cracks past one live tree and a stump. 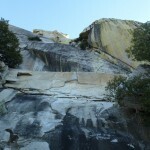 We simul-ed it without much trouble, then hiked back down around the dome to try something harder. Left Crack (5.8) had some fun climbing, though I found the starting traverse fairly scary. 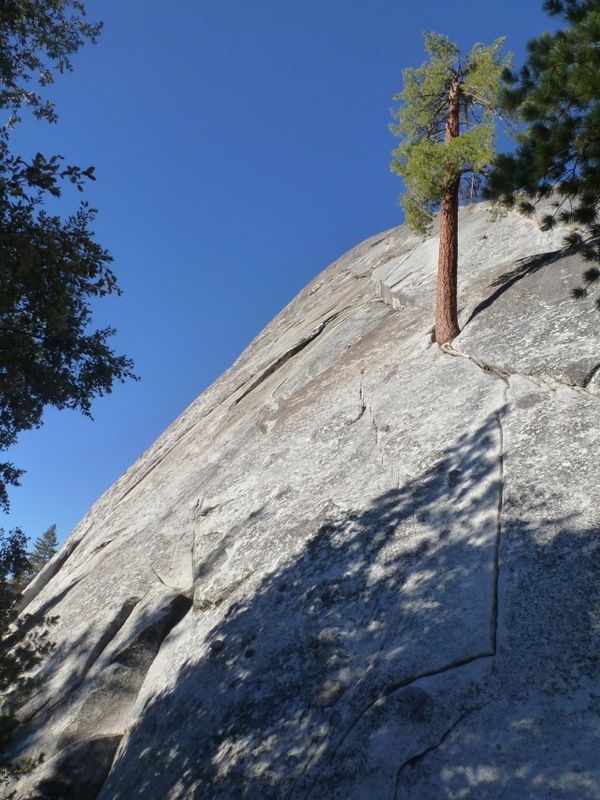 The pitch climbs 10-15′ off the ground, then follows a horizontal crack to reach the leftmost of two vertical ones. 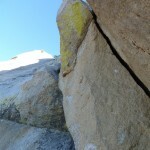 Though the traverse evidently protects well if you hand-traverse the horizontal crack, you first have to pass the crack’s shallow, flaring start. 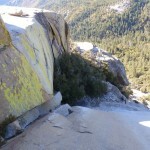 I instead ended up foot-traversing the crack, running it out until I probably would have decked if I had fallen. 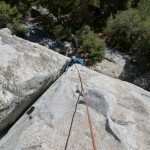 The climb up the vertical crack to a 2-bolt anchor was much less stressful. 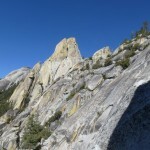 After top-roping the first pitch of a nearby face route from another anchor just to the right, we finished the climb. 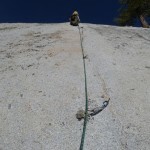 P2 followed the crack, then followed either a zig-zag traverse or some off-width to a nice belay ledge. 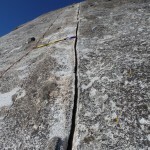 After a bolt and a flake that takes a tiny cam, P3 involves a tricky face traverse over to the “ear”, then some strenuous off-width/lieback action to another bolt, easier slabs, and another 2-bolt anchor. The first pitch of Last Dihedral was described as a sustained, hard-to-protect lieback, so we opted to scramble up to its right, then toprope it. The description was not accurate: the face has plenty of pockets for no-hands or one-hand rests, and there are two bolts on the nearby face and adequate opportunities to place gear. The second pitch was mostly easier and unremarkable. 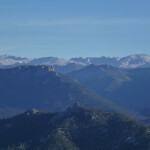 After availing ourselves of the better camping near Dome Rock, we made the long drive around and up the Lloyd Meadow Road to the southeast base of the Needles. While Mountain Project describes a confusing approach through a “perfect 3-dimensional lattice of cairns,” we followed a single well-defined use trail to the base of the route. We climbed the route as 5 60m pitches, with only P2 being a dud. 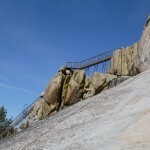 The route would be difficult to climb with a shorter rope. 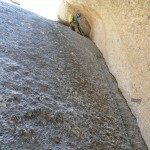 Jen led P1, up a wide crack next to a nicely-featured face, then across a low-angle face to an alcove. 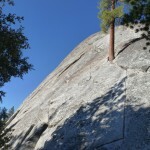 Following, I found it easier to climb the face than to jam body parts into the crack. I led P2, which started out with one exciting, blind move up the left side of the alcove on thin feet and okay hands. Pulling over the top reveals a sea of knobs, leading to easier terrain. 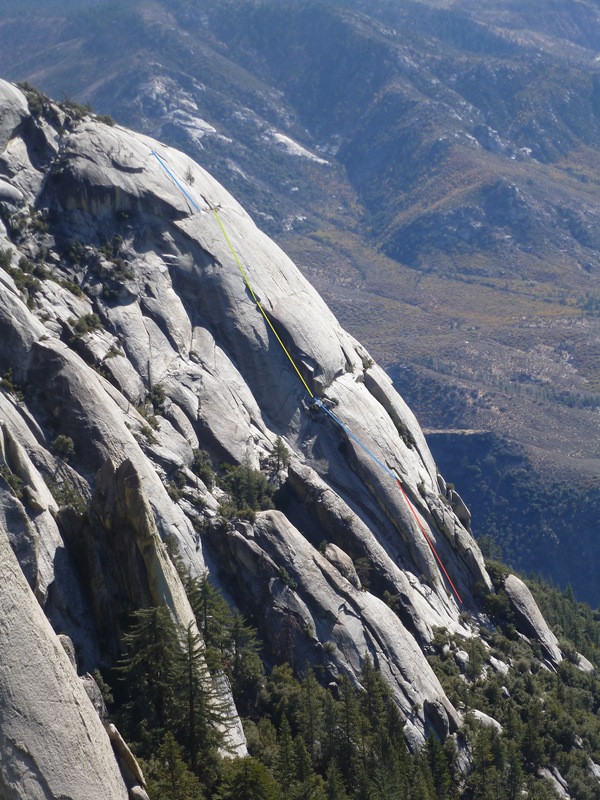 With careful rope-routing and/or quite a bit of rope drag, a 60m rope will take you over easier terrain to a comfy belay at the base of the dihedral pitch. 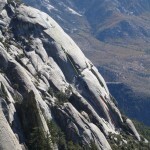 This 60m dihedral, the highlight of the route, can be climbed in various ways. As is her wont, Jen approached it as a hand/foot/finger crack; not feeling it for the final, runout lieback to the belay ledge, she belayed me up from a hanging belay to finish it. 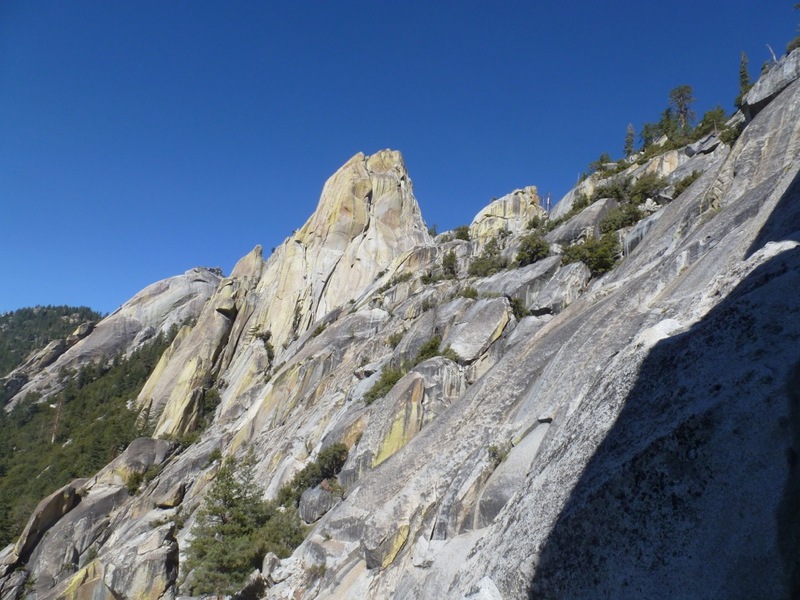 Being kind of a scrappy climber, I mostly chimneyed it, flying up the dihedral and thoroughly enjoying myself before finishing the pitch on lead, with one psychological micro-nut for protection. 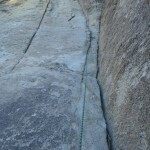 I led P4, a full 60m of sometimes-delicate slab climbing to a huge ledge, protected by 4 bolts. While none of it was truly desperate, one part after the second bolt made me think, and falling would have been uncomfortable. Talking to an old-timer the next day, I learned that the pitch used to have only two bolts — yikes! There appear to be a few paths from the big ledge to the top; Jen worked her way up a fun, straight splitter crack, then across easier terrain to a belay below the summit, near the end of our rope. 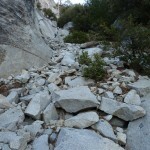 We fortunately had plenty of daylight left, because the descent is non-obvious. 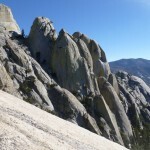 After climbing to the summit and rapping off the back (north) side, we initially found a faint use trail down the east side of the dome. 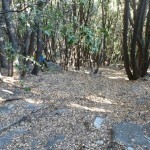 This trail faded out above steeper terrain near the base. We were fortunately not the only ones to make this mistake — a convenient bail sling got us through the difficulties. 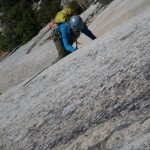 It looked possible to avoid another rappel by descending a gully farther left (east). 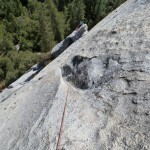 Our rappel deposited us in the “perfect 3-dimensional lattice of cairns,” which eventually led back to the main trail. The Needles lookout road was no more passable in daylight, so we hiked the last two miles of the road, passing two men in a pickup camped near the trailhead. Passing a sign informing us that the historic lookout had burned down last year, we continued along a pleasant trail along the north side of the ridge, with views of the southern High Sierra: Langley, Whitney, and (probably) the Mineral King area peaks. Following a faint, ducked use trail from the final saddle, we reached the base of the route without much trouble in about 1h30 from the car. Hearing voices as we roped up, we spotted the two men with the pickup truck, who were planning to climb the same route. P1 starts with an avoidable lieback/undercling section, then continues to a comfortable ledge. P2 crosses easy terrain including a ledge with many loose rocks, then climbs some underclings to old gear below a roof near the crux, where I established a hanging belay. Jen, after exploring terrain to the left, managed to work her way through an absurdly-steep lieback/mantle directly above the anchor, then up some easier stuff to the crest of the ridge. Fortunately she did not place any gear that would have required me to follow the lieback: after falling a couple of times, I took the standard (probably height-dependent) route around to the left, stepped over to retrieve a piece, and finished the pitch. The rest of the climbing from here to the top is mostly easy slab. We set up a couple of belays, but the whole thing would probably best be simul-climbed. 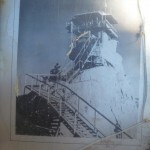 One more short, steep pitch led to the summit and the remains of the lookout, including an Escheresque stairway to nowhere. 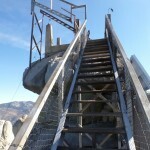 While the climbing is not that interesting, Magic Dragon is still a fun, scenic route. 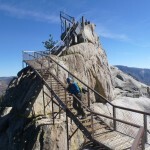 If you choose the formerly-standard stair descent, note that the Forest Service has installed an easy 5th-class gate with barbed wire near the base. Tree Route P2 — amazing!